From the front door to the garage door and everything in between, we’re in the era of the smart home. Homes where appliances, lighting, fans, refrigerators, and many other electronic devices can be controlled remotely by voice, phone, tablet, or computer. If you’re planning to sell your home, adding some cool tech features could wow potential buyers who are looking for move-in-ready tech. Smart-home technology can set your place apart from the competition in the housing market and potentially increase its value. If you’re not going anywhere or planning some overdue renovations, installing even minor tech like USB wall outlets will make you feel you’re living like The Jetsons. Smart-home integration is a strong investment. According to a survey by Houzz, smart tech has become more of a priority for renovating homeowners–28 percent said it’s at the top of their lists. And in the luxury home market, these features are widely expected. Like most new cars that don’t need keys, keyless residential locks are growing in appeal. If you want to be able to lock and unlock doors via an app or fob, you or a locksmith will need to check your existing locks to make sure they can accommodate the keyless variety. If not, the doorknob/lock opening might have to be recut or, in some case, a new door might be the only answer. Something else to think about is a backup key. If your phone runs out of juice and you can’t use the app, is a fob or key provided for alternate unlocking? Make sure you do your smart-homework to understand the capabilities of the many locks available. The ubiquity of USB-powered devices can mean there’s never enough AC wall outlets in a home to charge them all. Wall outlets with built-in USB charging ports are the solution. They come in a variety of sizes and configurations. The newest have fast USB-C ports, which might be costlier than previous USB versions but charge at faster rates. Most outlets can be installed by do-it-yourselfers, but if you’re nervous about working with electricity, call in a professional. Security doorbells with cameras can, among other things, unlock the door to let in a guest and turn on outdoor security lights. Some come with free online storage so you can review any activities; others offer optional storage plans. Like many smart devices, they work over your home’s Wi-Fi and your phone carrier’s network. Again, installation is relatively easy, but having it done professionally can bring added peace of mind. Why lift a finger to brighten a dark room when you can just raise your voice? 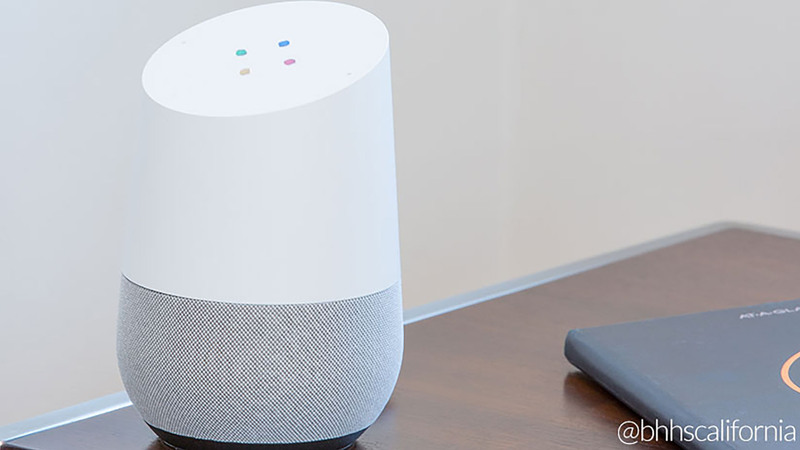 If you have an Amazon Echo, Google Home, or another voice-activated device, you’re aware that new accessories are constantly arriving to interface with them. Among the coolest could be light controllers and dimmers. You simply replace your light switches with chip-based panels that not only have touch controls, but also respond to your voice commands via Alexa, Google Assistant, or Apple’s Siri. Never wonder again if you left the garage door open or closed. Attach an app-controlled sensor with a camera to keep an eye on your door from your smartphone, tablet, or computer. It works with your wall switch or ceiling motor, and the app lets you monitor everything from anywhere over your Wi-Fi or cell carrier’s network. Believe it or not, you can immerse your body in sound while you’re immersed in the tub. Hidden speakers in KOHLER’s VibrAcoustic bathtub emit sound waves that envelop and gently resound within the body. Plug in your smartphone, tablet, or MP3 player via auxiliary-in cable. Add your own receiver to stream wirelessly via Bluetooth. Choose a soothing spa session with built-in compositions, unwind to your own music playlists, or catch up on news and podcasts.